I`m trying to create a sphere-like view using qgis and the "world from space"-projection http://spatialreference.org/ref/sr-org/6980/ (essentialy an ortho-projection). ArcGIS wraps the shapes correctly but QGIS (2.01) produces nasty artifacts. I have to produce the globes on a regular basis with different angles so does anyone out there have an idea how to fix this problem? As Andre said, for this to work, you'll need to crop your layer before projecting it. Andre describes a manual method, which works well for a lot of cases: Project your shapefile to an azimuthal equidistant projection with the same parameters as the orthographic projection, create a clipping circle that covers the hemisphere that will be visible in the orthographic projection, and clip the shapefile with that. 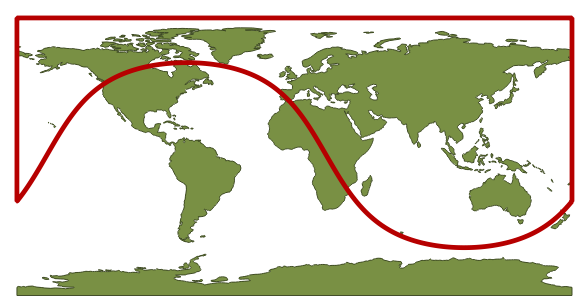 However, that method requires a fair bit of manual effort, and doesn't work for all projection parameters, since projecting to an azimuthal equidistant projection can lead to similar problems as projecting to an orthographic projection. 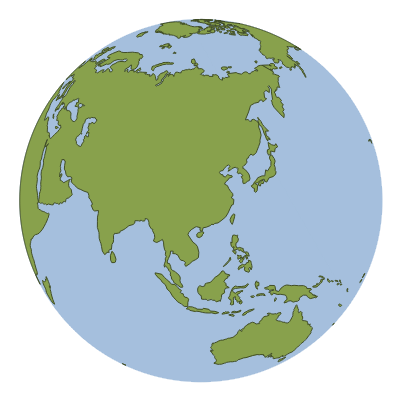 Here's a script (now also available as the Clip to Hemisphere QGIS plugin) that takes a slightly different approach: A clipping layer is created in the coordinate reference system of the original shapefile by projecting a circle from the orthographic to the source CRS, but additionally making sure to cover the whole visible hemisphere, including the visible pole. Here's the script. Make sure to save it in your Python path, for example as 'cliportho.py'. 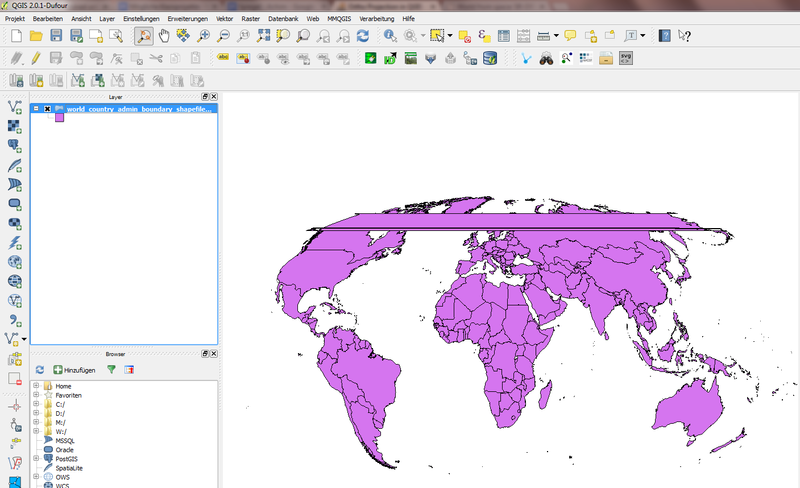 Then you can import it in the QGIS Python console using import cliportho. To clip a layer, call cliportho.doClip(iface, lat=30, lon=110, filename='A.shp'). targetProjString = "+proj=ortho +lat_0=" + str(lat) + " +lon_0=" + str(lon) + "+x_0=0 +y_0=0 +a=6370997 +b=6370997 +units=m +no_defs"
You have to crop your polygon data to the visible half of the globe, because QGIS does not do that by itself. Where did the polygons go after projecting a map in QGIS? Not the answer you're looking for? Browse other questions tagged qgis arcgis-desktop shapefile coordinate-system or ask your own question. How can I crop a raster layer to a hemisphere? Dateline disappears after clipping shapefile to hemisphere? Defining a projection and CRS for shapefile with undefined projection?